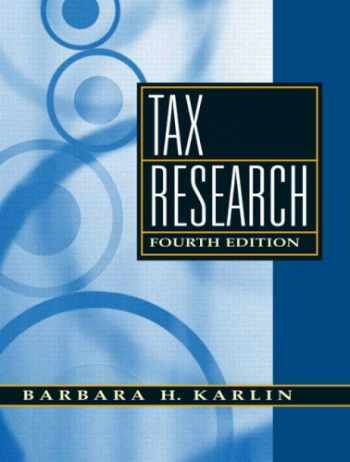 Acknowledged author Barbara H Karlin wrote Tax Research (4th Edition) comprising 560 pages back in 2008. Textbook and etextbook are published under ISBN 013601531X and 9780136015314. Since then Tax Research (4th Edition) textbook received total rating of 3.5 stars and was available to sell back to BooksRun online for the top buyback price of $57.50 or rent at the marketplace. This text covers the most up to date tax research students need to know from a practitioner’s perspective. Treasury interpretations, overview of tax procedure, judicial interpretations, communicating research results, and the internal revenue code. For the tax practitioner.